The Hermit is a seeker for the knowledge that comes from within. A lonely wanderer in the path of the night, he searches for that which can only be gained with long periods of solitude - the inner voice. To hear it, he must disconnect from the crowds whose voices and desires threaten to overcome his own. He walks through the dark night of his unconscious, guided only by the low light of the northern star, with his destination being his home, his self. He walks through the dark night of his unconscious, guided only by the low light of the northern star, with his destination being his home, his self. You are currently contemplating that you need to be alone. Never be afraid to take this chance to reflect, as it could help you clear your mind of all the clutter that comes with everyday life. 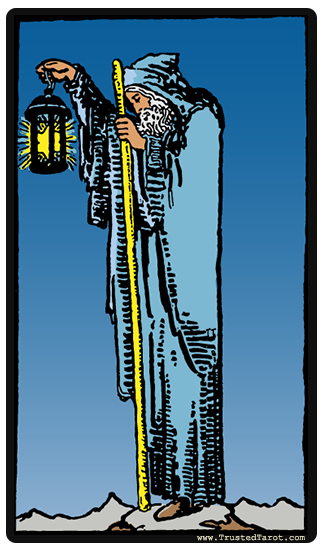 The Hermit may also refer to your effort in taking action that is authentic and aligned with your true self. You are perhaps searching your inner soul for guidance on what is right, and where your next steps are to be. The hermit's appearance in a reading can also denote the appearance of someone who will come to your life that will be your mentor. When reversed, you are perhaps in a situation where you'd like to be alone; there is nothing wrong about that. However, there is a possibility that your seclusion may become harmful to both yourself and others. Though the Hermit sets forwards with noble intentions to search for his inner truth, his path inward may also be filled with great danger. Going inward may lead to madness and the abyss, for the unconscious is filled with images that he may not yet understand, lurking and waiting to lure you ever inside. Like a man that gets lost in his own dreams, the hermit may find himself stuck in a world of his own, alone, trapped, unreal. You must learn to balance your need for truth with connection to your fellow human. When it comes to work, the hermit reversal meaning refers to your preparedness to get to the bottom of something that has been troubling you for quite some time now. There is searching to be done, and it will be your responsibility to ask the question that will allow the other people to understand the circumstances.